The purpose of this document is to detail the installation and configuration of an Uplogix Local Manager (LM) to manage and facilitate remote connectivity to a Palo Alto firewall. 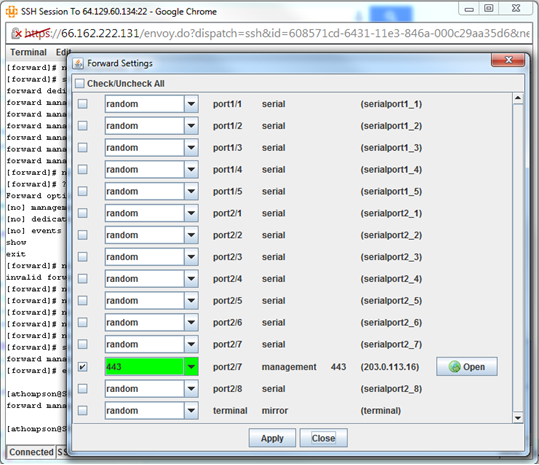 Supports Palo Alto firewalls running PAN-OS version 4 or higher. Connect a free serial port on the Local Manager to the Palo Alto’s RS-232 console management port with a standard Cat-5 cable. The Local Manager serial port connected to the Palo Alto is configured via the config init command. Automatic backup of the configuration is scheduled. Login successful; credentials are valid. The default console settings for the Palo Alto firewall are 9600 bit rate, 8 serial data bit, no serial parity, serial stop bit 1, and no flow control. The Uplogix Local Manager can save up to twenty backup images on its file system for use in restoring a configuration or pushing a configuration to a new Palo Alto. The file can be transferred to the LM via TFTP or SCP. There are multiple steps to restore a backup configuration to a Palo Alto firewall. The file may be transferred via SCP or TFTP. Upon entering one of those commands, the Uplogix LM will connect to the Palo Alto’s CLI, transfer the candidate configuration, and apply the configuration. The Local Manager can be configured to monitor the status of a managed Palo Alto using the paloAltoStatus rule set. The LM will check the Palo Alto for environmental alarms and high CPU usage. High CPU usage or system heat will trigger an alarm on the LM. description - ruleset to query Palo Alto for CPU info, environmental alarms, etc. action alarm GENERIC -a "system hot"
action alarm CPU_LOAD_MAJOR -a "CPU load high"
action alarm GENERIC -a "device not responding to CPU and environmental checks"
action alarm GENERIC -a "serial cable unplugged or device powered down"
Users may now connect to the web interface through an SSH tunnel using the port forwarding feature. In SSh applet on the Control Center, click Terminal, then Forward. Select the Palo Alto’s port, enter 443 for the port number, and click Apply. Now, port 443 on 127.0.0.1 on your workstation will connect through the SSH tunnel created by the LM to the web interface on the Palo Alto.